We've finally put out a 4-way split cassette on Jozik records. The artists on the split are Architeuthis Rex from Italy, Hobo Cubes from Canada, Mpala Garoo from Russia and our project Banana Pill. We've been waiting for this release for a long time. We even had to change one of the artists on the cassette. Originally there was supposed to be Summer Recreation Camp from Spain, but unfortunately he did not have time to record his material and we got Hobo Cubes on the split instead. I hope we manage to release something by Summer Recreation Camp some other time in the near future. I've spent quite a lot of time creating the covers (i still have not finished them all), but i like them. For the fabric envelopes i've bought a huge skirt from a second hand shop. We ordered orange tapes via e-bay from a very nice guy rainbowtapes. Even though shipping was a bit too expensive, the cassettes look good and the quality is good as well. I did not want to make any stickers with artists' names for the cassettes, because the cassettes look good on their own. So i used a hole-puncher to make blue and green sticker dots to indicate the sides of the tape. 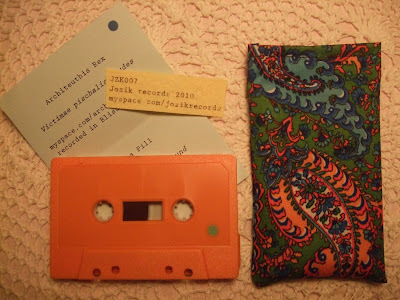 The tape can be ordered from Jozik records. Do you have any copies of this release still available? Jozik appears to be all sold out...Keep up the great work!